It was early April at Las Vegas, but felt like hottest summer for a Minnesotan. The sky was clear at that night. 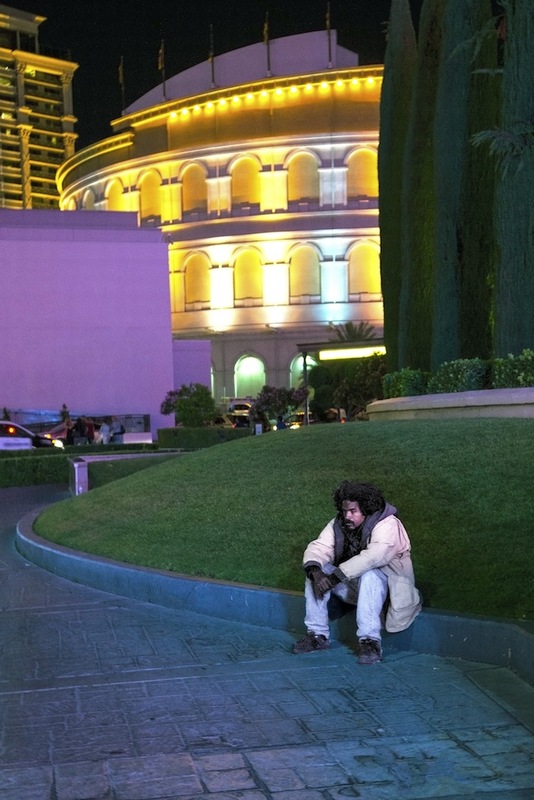 My friend and I were strolling down Las Vegas Boulevard, snacking, drinking and picturing. The neon lights along the streets were shinning strong and lightening everything. Loud musics were playing and people were happy as if they all won some money at those casinos. Just around a dim corner not too far from that famous Caesars Palace, I spotted this guy, quietly sitting on the road curb. His facial expression was lonely and gloomy, and apparently his warm coat was Off-Season in the weather of around 90 degree. I couldn’t image whether he was homeless, penniless, or just want to be away from families or friends for a while? My curiosities encouraged me to take my camera’s lens cap off, and snap this sight which was not so harmonious with its surroundings. Previous postMy Name is Constant…..
Not sure if he’s enjoying his solitude cause he looks kind of worried and somber in spite of the bright lights behind him. Excellent shot and loved your narrative too.